With 2012 fast approaching, there has been a lot of speculation about the poles changing place or moving. While the possibility of a polar shift is quite possible, and appears to have happened in the past, another possibility needs to be considered. There is strong evidence that the surface of our planet -- the thin skin called the "crust" -- has suddenly shifted in the past. While the Earth remained in its normal axis, this shift caused entire continents and oceans to move, changing climates and altering entire ecosystems and weather patterns. We present the following information as proof of these past shifts and suggest that a similar event may be in store for Earth's immediate future. The "Shifting Poles Theory" was introduced by History Professor, Charles H. Hapgood, whose fascination with geography and ancient maps led to his re-discovery of the Piri Re'is Map [right click to enlarge]. 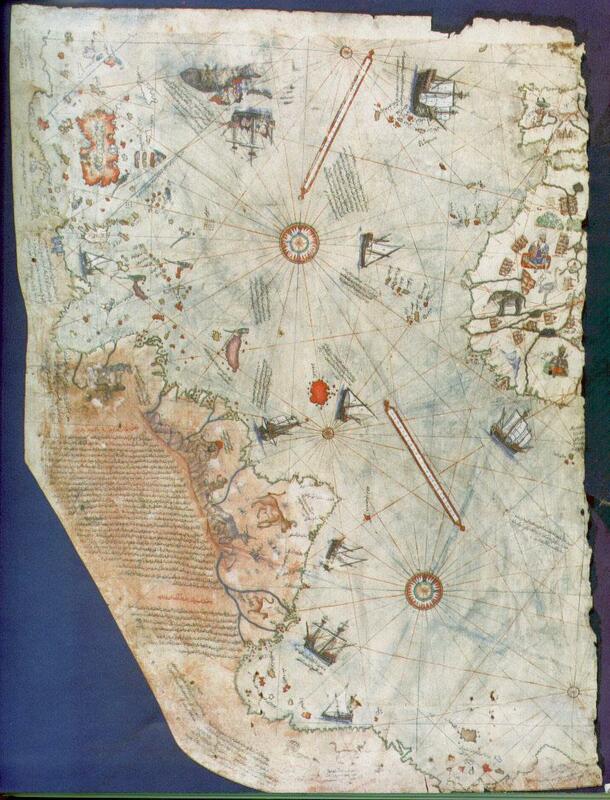 This hand drawn Turkish naval map had been gathering dust since the early 1500's, its significance unrealized. On closer scrutiny, Hapgood observed evidence of spherical trigonometry and a detailed knowledge of global geography-- including the coastline of Antarctica at a remote time, when it was free of ice. The map had been drawn just a few years after Columbus visited the Americas. The cartographer, Admiral Piri Re'is, described his world map as having been drawn from "very old" reference maps. It appeared as if some ancient, forgotten civilization had risen to these capabilities, and then had disappeared. The identity of these ancient mariners begged to be discovered. The most obvious place to look for such an old, yet advanced, civilization was in the famous accounts of the lost continent, Atlantis, described in somewhat vague, but realistic, commentary by the Greek historian, Plato. Captain Jacques Cousteau concluded that Plato's Atlantis was in the Mediterranean, near Greece. His underwater explorations found evidence of extensive maritime trading and skilled boat building, along with some artifacts dated to thousands of years B.C. But no vast metropolis was found. Scholars called attention to the utopian descriptions of Plato, who hinted that Atlantis was in the "ocean" and "beyond the pillars of Hercules," known today as the Straight of Gibraltar. And so tradition eventually placed Atlantis somewhere on the bottom of the Atlantic Ocean. But where? Thought to be one of the earliest "world maps" to show the Americas, the map was originally used to bolster Turkish national pride. Early scholars suggested that it showed accurate latitudes of the South American and African coastlines - only 21 years after the voyages of Columbus! (And remember, Columbus did NOT discover North America - only the Caribbean!) Writing in Piri Re'is own hand described how he had made the map from a collection of ancient maps, supplemented by charts that were drawn by Columbus himself. This suggests that these ancient maps were also available to Columbus and could have been the basis of his daring expedition. A copy of the map was presented to a diplomat in the U.S. government, where it remained a curious artifact for years. The true mysteries of of this map were eventually discovered by professor Charles H. Hapgood and revealed to the scientific community in his book, Maps of the Ancient Sea Kings. During scrutiny of the map, Hapgood discovered a partial charting of Antarctica, made during a period when the coast was free of ice. This coastal structure, now covered again by ice, was subsequently verified by satellite radar scanning. Ice core samples of the coastline have fixed the last ice-free period to between 11,000 B.C. and 4,000 B.C. Our historical understanding of navigation includes a period of time before which it was impossible to determine a ships latitude (North to South position) in the Southern Hemisphere. This was because the known method involved sighting the angle of the only fixed star -- the North Star -- which cannot be seen in the Southern Hemisphere because of the curvature of the Earth. Despite this handicap, these ancient maps showed amazing details and accurate latitude placement of many known islands along the southern most coastlines of Antarctica! But this paradox of history was even more astounding. 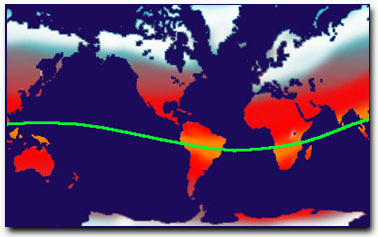 (See similar map on right, based on spherical projection and used for air flights originating in Cairo to determine distances and fuel consumption. This map was generated using sherical trigonometry -- a science unknown to scholars until its discovery by the mathematician Hipparcus). Scrutiny of the map shows that the makers knew the acurate circumference of the Earth to within 50 miles. The "center" of the source map projected from coordinates in what is now Alexandria -- the center of culture and home of the world's oldest and largest library until its destruction by Christian invaders. The coastline and island that are shown in Antarctica must have been navigated at some period prior to 4,000 B.C. when these areas were free of ice following the last Ice Age. With the invention of deep submersibles, the bottom of the North and South Atlantic have been mapped and their topography is now well known. The history of these oceanic floors is preserved in a succession of lava flows associated with the movement of tectonic plates. In other words, we're pretty sure that there is no sunken continent like Atlantis on these ocean floors. The same mapping has revealed recent changes in the habitable areas along the oceanic coastlines. Stone structures and a pyramid lie just off the coast of Bimany. Submerged forests have recently been found off the coastline of America's Northwest. Petroglyphs in Hawaii, carved into stone, are now covered by meters of the Pacific Ocean -- evidence of a lower ocean level. So while there is yet no sunken Atlantis, there does appear to be evidence of some dramatic changes to both the ocean levels and climates in our planet's recent history. Examining the ocean floor had many benefits to science. For geologists, it was the final piece of a puzzle that would explain how the Earth might be constructed. Their model started with an extremely hot core of dense iron and radioactive (heavy) elements. Encapsulating this hot and dense core, there is a thick liquid made of molten minerals called magma -- the same red material that oozes out of volcanoes as lava. A good part of our planet is made of this magma (called the mantle, which is thousands of kilometers thick). Surrounding this mantle is a thin crust of colder, solid minerals. This crust is like a thin skin that floats on the fluid magma. The skin is cracked and broken into several sections called "plates." We all live on this thin crust, on one of these plates. Scientists often make the analogy to a loose skin surrounding an orange. Some prefer the over-ripe avocado analogy because it has the hard central "seed" like the Earth's core. When atmospheric water condenses and forms the oceans, it collects like huge puddles on this thin skin, some which may be kilometers deep, depressing and compressing the crust. Areas that are free of this prodigious weight of water rise and form continents. Flaws in this delicate layer can result in volcanoes, and we now know that these can occur in the deepest oceans as well as on land. It was this "floating" of the Earth's crust that first sparked Hapgood's interest, and lead him to the ideas of Hugh Achincloss Brown. Brown had theorized that the entire earth could be made to be repositioned at a radically new angle on its axis of rotation. In other words, the Earth could change angle of its spin relative to the orbit around the Sun. Brown tried to use this argument to explain climatic changes, but his theory failed the test of mathematics. Brown's idea was not a new one. Some of the greatest geologists of the time, including J.C.Maxwell and Sir George Darwin (son of the famous Charles Darwin), considered this possibility, and decided that the stabilizing effect of the equatorial bulge was so great that no conceivable force originating within the Earth could make it shift on its axis, except for the collision with another planet. They, therefore, dismissed the idea of any shift of the poles as impossible and, in fact, not worth discussing. Their influence has been so pervasive that, to this day, no one has seriously considered such an hypothesis. Hapgood, too, accepted the assumption that only a planetary collision is capable of displacing the axis of rotation. But he had a new twist to this theory. He proposed that the shift of the poles resulted from a shift of the whole Earth's crust. The disturbances needed to slide the Earth's crust were far less than those needed to tilt the entire planet-- core and all. Based on the research of the Russian scientist V.V. Beloussov, he assumed that at a depth of a hundred miles or so, in the upper mantle, there is a layer of liquid rock (magma) which behaves as a lubricant or bearing, allowing the whole crust to shift when subjected to a displacing force. In Hapgood's opinion, this force is provided by the centrifugal momentum of ice caps eccentric to the poles. In other words, the weight of the ice on the poles is off-balancing the Earth's own daily rotation. Eventually, this imbalance gets to the point where a change occurs. According to Hapgood, the Earth keeps its axis of rotation unchanged, but the poles, and the whole Earth's surface, slide and change latitude. For a while, the Earth is balanced. Hapgood realized that the entire planet did not need to be repositioned around its axis to maintain its balance. Only the outer crust needed to move, just as the loosely peeled skin of an orange (or avocado) could be slid around the stationary inner fruit. This line of thinking was published in Earth's Shifting Crust, in collaboration with James H. Campbell, a mathematician-engineer. Hapgood then proposed looking for Atlantis in a place where no one had ever suspected -- Antarctica. Hapgoods reasoning went like this: He envisioned a catastrophic and dramatic move of the entire skin which allowed thick polar ice caps to melt in their new, warmer climate. Ice would again began to build up at the new poles, awaiting the next shift. In this scenario, Atlantis was repositioned to become a frozen and inhospitable continent, while the changing ocean levels reflected the amount of water locked up in the form of ice. Since Plato's Atlantis was in the center of "the great ocean," Hapgood summarized that Antarctica would have been a perfect candidate for the lost continent, especially if it had once been in a more Northern and moderate climate. Moreover, the legends of a catastrophic end to this advanced civilization could be descriptive of an abrupt continental slippage. If this is true, then we might well find our long lost mariners and mathematicians under the kilometers of ice that now cover the South Pole. A pole shift would displace the Earth's crust around the inner mantle, resulting in crustal rocks being exposed to magnetic fields of a different direction. Hapgood demonstrated his theory by documenting three Earth crust displacements in the last 100,000 years. Looking down on the current North Pole, we can identify at least 3 previous positions of the pole according to Hapgood. These are shown roughly by the numbered red dots in the map on the right. Position #4: The current position. 55,000 B.P. and then moving south-west by 50,000 B.P. towards what is now Hudson Bay. 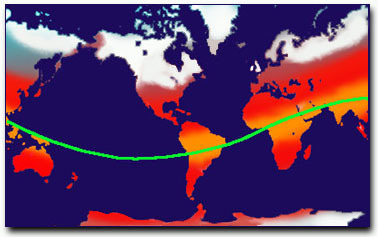 60 degrees N, 73 degrees W. From the Hudson Bay area at about 17,000 B.P. 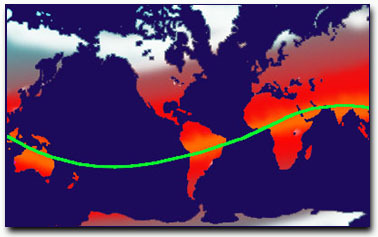 and moving north to its present location by about 12,000 B.P. The current position. When and where will the next shift occur?